Mary and I were asked to add curb appeal to a small front porch. 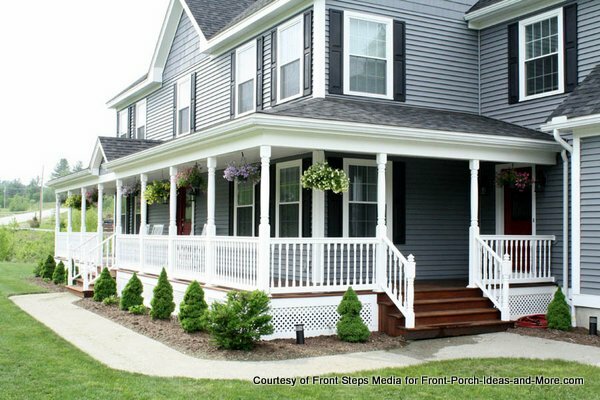 The homeowners wanted to sell their home and needed porch decorating ideas to add instant curb appeal for prospective buyers. 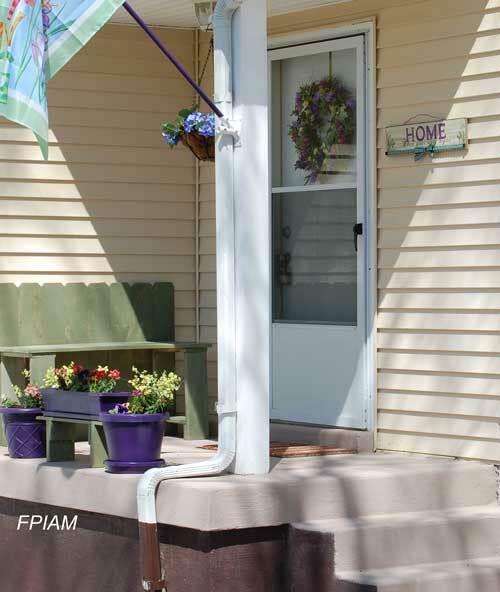 Like most of us, they didn't want to spend a lot of money and they needed their small porch to be appealing right away. And remember a first rule of business - you can't sell until you get them in the door! This particular home was a light yellow with white shutters and white trim. It was also the beginning of spring. What better color to complement yellow and white than purple. Once we decided on the primary decorating color we needed a focal point. 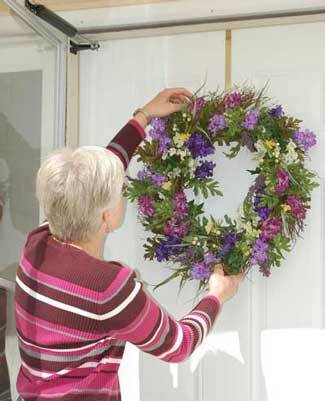 We knew a beautiful spring wreath on a white front door would stand out on this small front porch. So off to the craft store we went and luckily the spring wreaths were on sale. We quickly saw a beautiful decorative wreath that had just the right colors, purples and yellows. We contemplated making the wreath ourselves but the sale price made it an easy decision. Plus it saved us time for another project we had in mind. Since the porch sits some distance from the street we wanted to have something to catch people's eyes as they drove by. 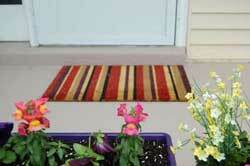 Another very good front porch decorating idea is to create movement. 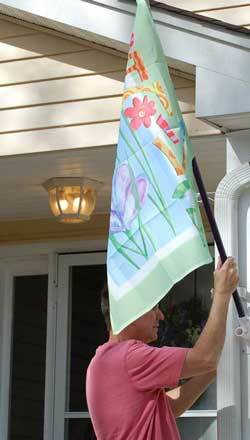 A colorful spring flag would do the trick. We chose this pretty spring flag because of its colors, purple, yellow and green, to carry our color theme throughout the small porch. Our flag pole was a boring brown. A few minutes with a can of purple spray paint quickly color coordinated the pole to complement the flag's colors. We still needed a little more pizzazz. The owners had planted pansies, violas and snap dragons in a planting area adjacent to the small front porch. 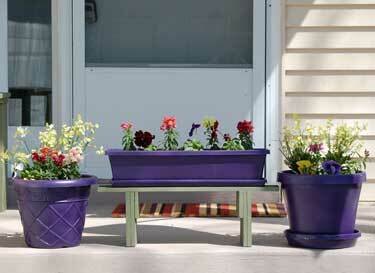 We carried that theme to the porch by planting pansies and snap dragons in purple pots. We purchased some inexpensive pots at Home Depot, and with spray paint, transformed the pots into a color coordinated array. 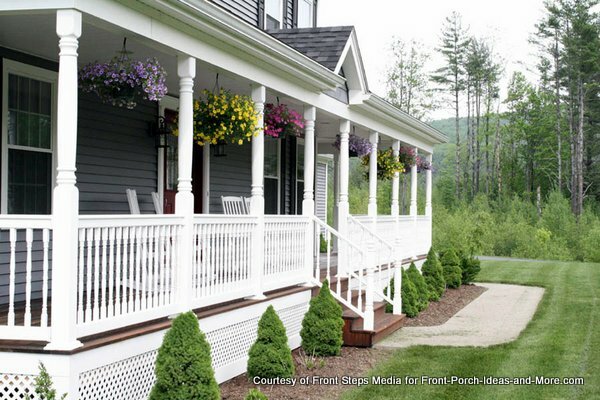 Once the flowers grow a little, the porch will be a mass of great color. To make a nice grouping of flowers, Dave built a small shelf for the horizontal planter to give it more appeal. We removed their standard black outdoor door mat and replaced it with one with vibrant spring colors to add just a little more appeal as they enter their new home! 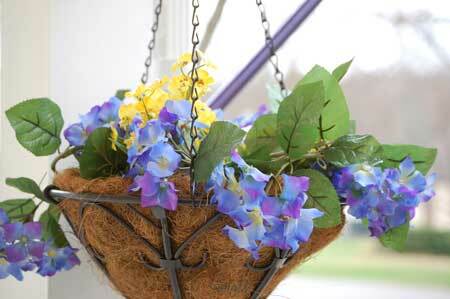 To bring the colors higher on the porch we chose a hanging basket. We used silk flowers to add immediate color and virtually no maintenance. We wired the flowers into the pot to withstand the spring rains and wind. Even a small front porch can accommodate some creature comforts. Hence, the bench. We had several reasons for making the bench. First, we wanted to add another spring color, green, to complement the purple and yellow. Second, we needed something with a little height to visually balance the flag. Most importantly, we wanted a place where parents could sit and visualize their kids playing in the driveway. Remember, our purpose was to help sell the home. 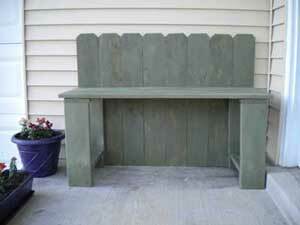 The bench cost less than $25 to make and I designed it so anyone could easily make it. It took just a few hours to make and only requires cross-cuts. You only need a hand saw, a drill, and screw driver or hammer. After we did all of the above and stepped back to take an overall look at our efforts, we realized we had to address the concrete porch floor. It really detracted from the overall look. So off to Home Depot for concrete paint. We also needed to break the large wall-look from the door to the picture window. It was just too much vacant space and drew your eyes away from the porch itself. We found this sign at Michaels on sale and knew it would do the trick. 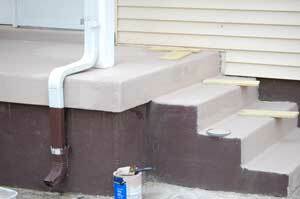 Mary added the porch colors to it using craft paints. The porch is now much more inviting to someone looking for their new home. Hardly a small front porch, but the decorating question would apply no matter what size porch you have. 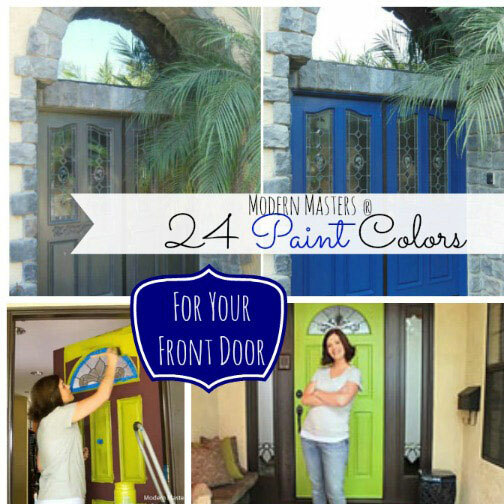 --- Should I get a white or black front entry door? --- Should I get white or black rocking chairs?" Our Reply: Thanks for your fun question and for visiting our site. Both Dave and I think you can't go wrong with either black or white for your porch rocking chairs and front door, but here are some suggestions we think you will like. Our friend, Bohnne Jones, who is a wonderful Interior Designer, offered these ideas and also gave us some great advice about furniture placement. 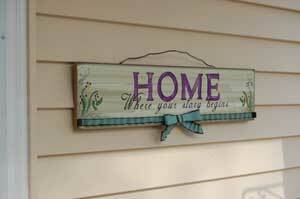 We would love seeing a picture of your porch when your porch decorating is done. Thank you so much for writing us. Just coincidentally, our friend, Todd from Home Construction Improvement shared these wonderful pictures of his farmer's porch. 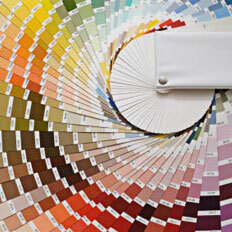 Is this similar to your home? Thought you would enjoy it. Besides this being a beautiful home with an amazing farmers porch, the hanging baskets are lovely, too. 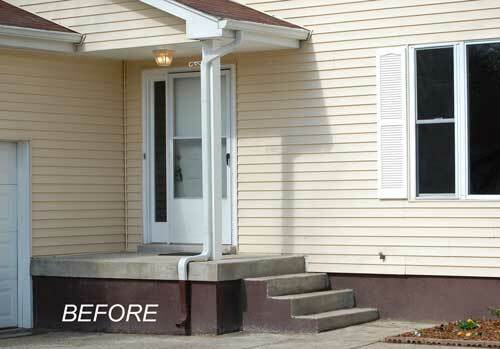 We had a great time adding some curb appeal to this small front porch and know it will draw the eye of potential buyers. Whether you are selling your home or just want to add appeal be sure to check the many decorating and design ideas on our site.